The government has strongly rebuffed an NGO’s request that retired King Norodom Sihanouk’s immunity be lifted in order to allow for investigation into his alleged involvement with the Khmer Rouge. The retired king, whose “inviolability” is guaranteed by Article 7 of the constitution, will remain im­mune, the government said in a state­ment released Friday and en­dorsed by Prime Minister Hun Sen.
“This issue was resolved following his retirement,” the statement said, referring to a law passed in 2004 stating that the retired king retains the “royal privileges and full immunity” guaranteed by the constitution. “The Cambodian government would like to announce its strong re­jec­tion of any ideas to strip the re­tir­ed King Norodom Sihanouk’s im­mu­nity in order to prosecute him,” the statement said, adding that No­rodom Sihanouk was also a victim of the Khmer Rouge and lost numerous relatives during the regime. 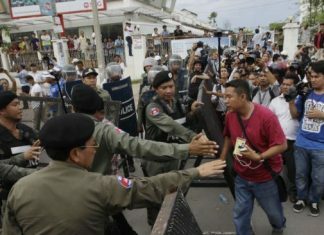 In an Aug 20 statement addressed to National Assembly President Heng Samrin, the US-based NGO Cambodian Action Committee for Justice and Equity called for the retired king to be investigated for his short-lived role as Democratic Kampuchea’s symbolic head of state, after which he spent most of the Pol Pot era under palace arrest. The telephone number for CACJE’s local contact listed on the statement was not recognized by mobile networks Sunday. Royal Palace cabinet member Oum Daravuth could not be reach­ed for comment. National Assembly Deputy Pre­sident Nguon Nhel said the NGO’s request had already been dismissed because only one third of lawmakers or the prime minister can legally call for a National Assembly meeting. ECCC press officer Reach Sam­bath said Sunday, “It is up to the courts to decide who is right and who is wrong, who should be investigated and who should not be investigated.” He added that, in his opinion, the government’s response to the NGO’s request showed its support for the integrity of the tribunal. According to the constitution, she said the retired king is non-political and should steer clear of ECCC proceedings, even as a witness.